Recent data indicate that excitotoxicity of high levels of neurotransmitter glutamate may be mediated via programmed cell death (apoptosis) and that it can be prevented in HT22 mouse hippocampal cells by various equine estrogens with Δ8,17β-estradiol (Δ8,17β-E2) being the most potent. In order to delineate the mechanism(s), glutamate-induced cell death of HT22 cells was assessed by measuring (a) DNA fragmentation in the presence or absence of 11 equine estrogens (components of the drug CEE); (b) cell death and (c) levels of anti-apoptotic (Bcl-2) and proapoptotic (Bax) proteins in the presence or absence of two equine estrogens, Δ8,17β-E2 and 17β-estradiol (17β-E2) by LDH release assay and Western blot analysis respectively. Glutamate treatment induced cell death was time and dose-dependent. After 18 to 24 h, glutamate induced DNA fragmentation and morphological characteristics of apoptotic cell death. DNA fragmentation and morphological changes induced by 10 mM glutamate were completely inhibited by some equine estrogens. Exposure of cells to various concentrations of glutamate, resulted in a significant increase in cell death associated LDH release that was time-dependent. Both Δ8,17β-E2 and 17β-E2 inhibited the glutamate-induced LDH release and cell death in a dose-dependent manner with Δ8,17β-E2 being 10 times more potent than 17β-E2. Western blot analysis indicated that glutamate also significantly decreased the levels of Bcl-2 and increased Bax levels. This glutamate-induced change in the ratio of Bcl-2 to Bax was reversed by estrogens with Δ8,17β-E2 being more potent. In HT22 mouse hippocampal cells, glutamate induced apoptosis that was associated with DNA fragmentation, morphological changes and up-regulation of the pro-apoptotic protein Bax and down-regulation of the anti-apoptotic protein Bcl-2. This apoptotic process was differentially prevented by some equine estrogens with Δ8,17β-E2 being more potent than 17β-E2. Since HT22 cells lacked both glutamate and estrogen receptors, the neuroprotective effects of estrogens most likely involve both genomic and non-genomic mechanisms. Since Δ8-estrogens are less feminizing estrogens than 17β-E2, further chemical modifications of these Δ8-estrogens may provide more selective estrogens that will be useful in the prevention of neurodegenerative diseases such as Alzheimer's and Parkinson's in both aging men and women. High concentrations (mM) of the excitatory neurotransmitter glutamate can accumulate in the brain and are thought to be involved in the etiology of a number of neurodegenerative disorders including Alzheimer's disease [1–4]. A number of in vitro studies indicate that at high concentrations, glutamate is a potent neurotoxin capable of destroying neurons maintained in tissue culture [5–10]. The mechanisms by means of which glutamate-induced neurotoxicity or excitotoxicity is mediated are not fully understood, however, a substantial body of evidence suggests that glutamate toxicity involves oxidative stress and programmed cell death (apoptosis) [2, 11]. This form of cell death is characterized by DNA degradation that results by cleaving DNA at internucleosomal sites by endonucleases . A number of studies have demonstrated that estrogens are potent anioxidants that may inhibit some of the neurotoxic effects of oxidative stress [7, 13–15]. Recently, we reported that neurotoxic effects of oxidized LDL can be differentially inhibited by equine estrogens with the novel Δ8-estrogens being the most potent neuroprotectors . Oxidative stress has been implicated in neurodegenerative diseases such as Alzheimer's disease , Parkinson's disease [2, 18] and observational studies indicate that exogenous estrogen use by healthy postmenopausal women can either reduce the risk or delay the onset of Alzheimer's disease [19–23]. We and others, [7, 13–17, 24] have demonstrated that estrogens are potent antioxidants. Furthermore, we [15, 16, 24] also demonstrated that equine estrogens differed extensively in their neuroprotective potencies in both estrogen receptors ER positive (PC12 cells) and ER negative (HT22) neuronal cell lines. Moreover, the neuroprotective potencies did not correspond to their binding affinities for human ERα and ERβ . Since HT22 cells lack both ERs and ionotropic glutamate receptors [6, 7, 13], high concentrations of glutamate kills these cells via oxidative pathway [26, 27]. Therefore, to gain insight into the cellular mechanisms involved in the differential inhibition of glutamate toxicity by various equine estrogens, we selected HT22 cell line as a model for neuronal cells. The objective of the present study is to delineate the mechanism(s) involved in the neuroprotective effects of estrogens in the glutamate-induced cell death. We hypothesize that equine estrogens by an ER-independent mechanism prevent glutamate-induced programmed cell death by inhibiting DNA fragmentation and modulating levels of anti-apoptotic and pro-apoptotic proteins, Bcl-2 and Bax, respectively, that are known to play a key role in cell life and death [28–30]. HT22 cells were harvested between 18 or 24 h after glutamate (5 to 20 mM) incubation and total DNA was extracted, purified and subjected to agarose gel electrophoresis. The results indicate that cells cultured in the absence (control) of glutamate did not induce any DNA fragmentation (Figure 1A, Lane 2). In contrast, glutamate induced characteristic DNA fragmentation or laddering in a dose-dependent manner, (Figure 1A, Lanes 3–5). The extent of fragmentation was similar between 18 h, (Figure 1A, Lane 6) and 24 h, (Figure 1A, Lane 4). All subsequent DNA fragmentation experiments were carried out for 18 h and in the presence of 10 mM glutamate. Addition of various equine estrogens (10 μM) resulted in complete inhibition of DNA fragmentation with only 17α-Eqn (Figure 1B, Lane 7), Δ8-E1 (Figure 1B, Lane 8), and Δ8,17β-E2 (Figure 1C, Lane 8). The remaining eight estrogens including 17β-E2 were ineffective at this dose of estrogen (Figure 1B, Lanes 1, 4–6 and Figure 1C, lanes 4–7) in preventing DNA fragmentation induced by 10 mM glutamate. Glutamate-induced apoptotic cell death was also detectable by characteristic morphological changes observed by using phase contrast microscopy (Figure 2). 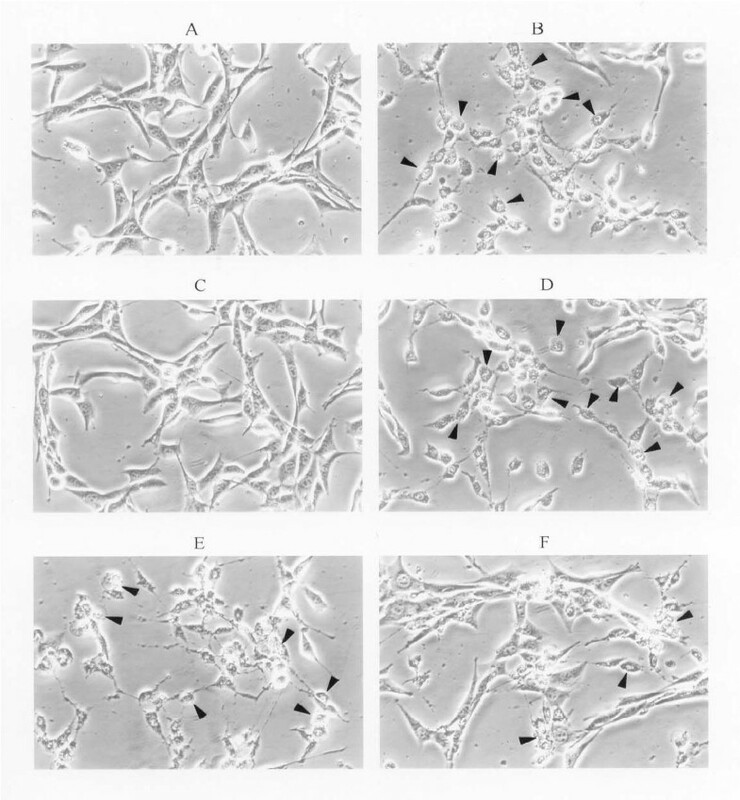 After an 8 hr incubation with 8 mM glutamate, dead cells were clearly visible in the cultures (Figure 2B), and the cellular extension (dendrites) seen in untreated HT22 cells (Figure 2A), were retracted, and cells appeared rounded and detached. Degenerated cells were also clearly visible (Figure 2B). In the presence of 8 mM glutamate and 10 μM Δ8,17β-E2, the cells (Figure 2C) retained the morphology of untreated cells and degenerated cells were absent. In contrast, in the presence of 10 μM 17β-E2, the cells have the appearance of cells treated with 8 mM glutamate alone and a large number of dead cells were visible (Figure 2D). These results clearly indicate that Δ8,17β-E2 was able to prevent glutamate induced cell death while the same amount of 17β-E2 was not protective. However, when the cells were treated with 5 mM glutamate for 18 h, the extent of cell death was less (Figure 2E) and under these conditions, the morphological changes and cell death induced by glutamate was also preventable by 10 μM 17β-E2 (Figure 2F). Detection of glutamate (5 to 20 mM) induced DNA fragmentation (DNA ladder) and its prevention by some equine (10 μM) estrogens. A: Lane: 1 = 1 kb DNA ladder; 2 = control HT22 DNA; 3 = 5 mM glutamate; 4 = 10 mM glutamate; 5 = 20 mM glutamate; 6 = 10 mM glutamate (18 h). B: HT22 cells treated with 10 mM glutamate for 18 h in presence or absence of estrogens. Lane: 1 = 17α-E2; 2 = control; 3 = 10 mM glutamate; 4 = 17β-E2; 5 = Eq; 6 = 17β-Eqn; 7 = 17α-Eqn; 8 = Δ8-E1. C: Lane: 1 = 1 kb DNA ladder; 2 = control; 3 = 10 mM glutamate alone; 4 = E1; 5 = Eqn; 6 = 17β-Eq; 7 = 17α-Eq; 8 = Δ8,17β-E2. Gel electrophoresis was carried out as described under methods and the gels were stained with ethidium bromide. Glutamate-induced toxicity in mouse hippocampal HT22 cells as assessed by phase contrast microscopy (200×). HT22 cells were cultured and treated with glutamate alone or in the presence of estrogens for 8 to 18 h. Degenerated cells are depicted by arrows. A = Untreated control cells; B = 10 mM glutamate; C = 10 mM glutamate + 10 μM Δ8,17β-E2; D = 8 mM glutamate + 10 μM 17β-E2; E = cells treated with 5 mM glutamate for 18 h; F = 5 mM glutamate + 10 μM 17β-E2 for 18 h.
In order to follow the kinetics of glutamate cytotoxicity, HT22 cells were cultured in 6-well plates (2 × 105 cells/well) for 24 h. The medium was then changed and the effects of 10 mM glutamate on LDH release as a function of time were measured for up to 18 h. The results shown in Figure 3 indicate that glutamate toxicity varied markedly during the course of cultures. Significant increase (2 to 3 fold) in cytotoxicity was noted after 8 h to 18 h exposure of cells to glutamate. 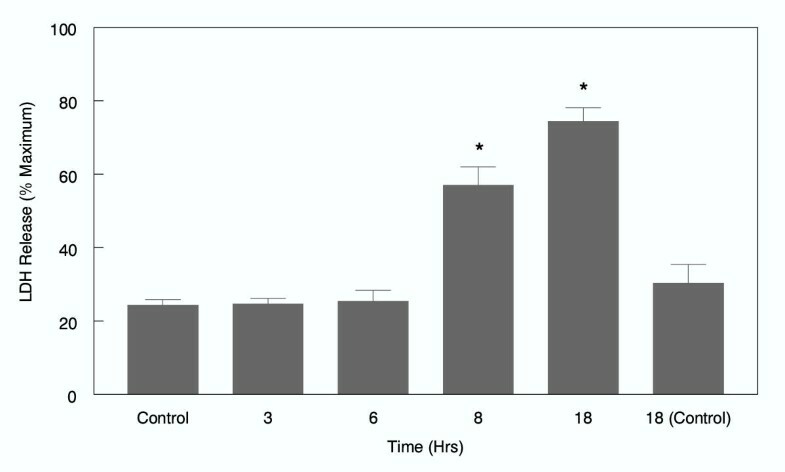 LDH release in untreated control cells remained essentially unchanged over the 18 h period (Figure 3). We next determined the effect of increasing concentration of glutamate on cell death. As shown in Figure 4, exposure of cells to 7 to 10 mM glutamate for 8 h resulted in a significant increase in LDH release compared to the control cells. 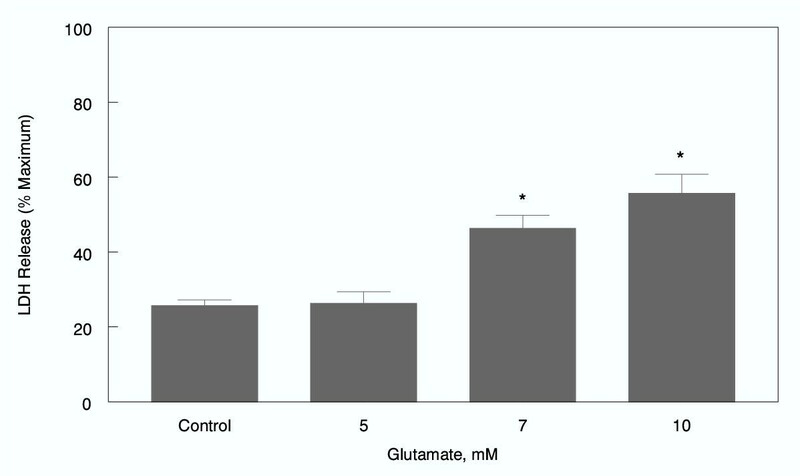 Lower concentration (5 mM) of glutamate over a period of 8 h had no detrimental effect on the cells. However, exposure to 5 mM glutamate for 18–20 h also resulted in a significant 2 fold increase in LDH release (Figure 5). Kinetics of glutamate-induced cell death in HT22 cells. Effect of various concentration of glutamate on cell death in HT22 cells. LDH release was measured after an 8 h treatment. *P < 0.05 vs untreated control cells. Effect of various concentrations of 17β-E2 and △8, 17β-E2 on glutamate (5 mM) induced cell death. LDH release was measured after 18 h treatment a = P < 0.05 vs untreated control cells; b = P < 0.05 vs glutamate alone treated cells. Based on DNA fragmentation data, two estrogens: 17β-E2 and Δ8,17β-E2 were tested to investigate the effect of equine estrogens on glutamate-induced cell death. In these experiments, HT22 cells were cultured in the presence of 5 mM glutamate for 18–20 h in the presence or absence of various concentrations of the two estrogens. Release of LDH from cells was measured and the results are depicted in Figure 5. Both 17β-E2 and Δ8,17β-E2 inhibited the glutamate-induced cell death in a dose-dependent manner, however, Δ8,17β-E2 was 10 times more potent. Thus 0.1 μM Δ8,17β-E2 and 1 μM 17β-E2 significantly reduced the release of LDH compared to glutamate alone. Higher concentrations of Δ8,17β-E2 (1 μM) and 17β-E2 (10 μM) completely inhibited the glutamate-induced cell death and the LDH release returned to control values (Figure 5). When cells were exposed for 8 h to higher concentrations of glutamate (7–8 mM), only Δ8,17β-E2 was able to significantly inhibit glutamate-induced cell death and return the LDH release to control values. However, under these conditions, higher concentration (10 μM) of Δ8,17β-E2 was needed. In contrast, 17β-E2 had no significant effect on cell death induced by this concentration of glutamate (Figure 6). Effect of various concentrations of 17β-E2 and Δ8,17β-E2 on glutamate (7–8 mM) induced cell death. LDH release was measured after 8 h treatment. a = P < 0.05 vs untreated control; b = P < 0.05 vs glutamate alone treated cells. Following the measurement of LDH in the medium, the cells treated with glutamate were processed for Western blot analysis as described under "Methods". 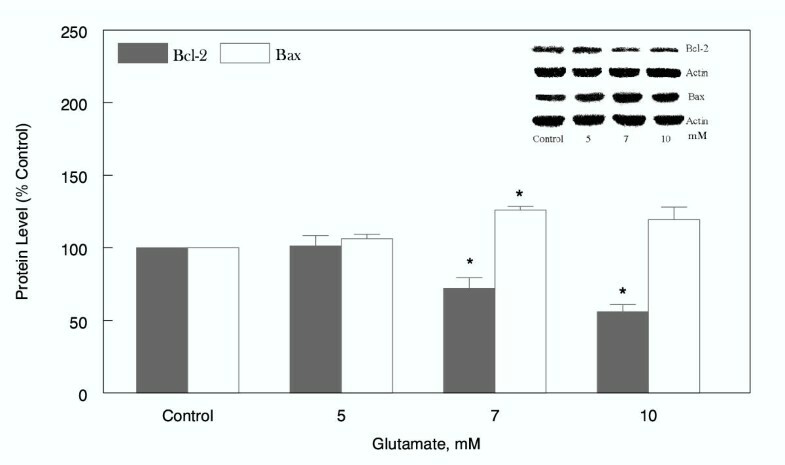 The results indicate that levels of Bcl-2 decreased significantly while those of Bax increased significantly between 7 to 10 mM glutamate within 8 h, (Figure 7). Thus, 7 and 10 mM glutamate decreased Bcl-2 protein levels by 30 and 45% respectively, while Bax protein levels increased by 20 to 25% respectively (Figure 7). No change in Bcl-2 and Bax levels were observed in the presence of 5 mM glutamate for 8 h, (Figure 7). However, after 18–20 h exposure to 5 mM glutamate, the protein levels of Bcl-2 decreased and those of Bax increased (Figure 8). These results clearly indicate that glutamate modulates apoptotic pathways by inducing changes in anti-apoptotic and pro-apoptotic factors. 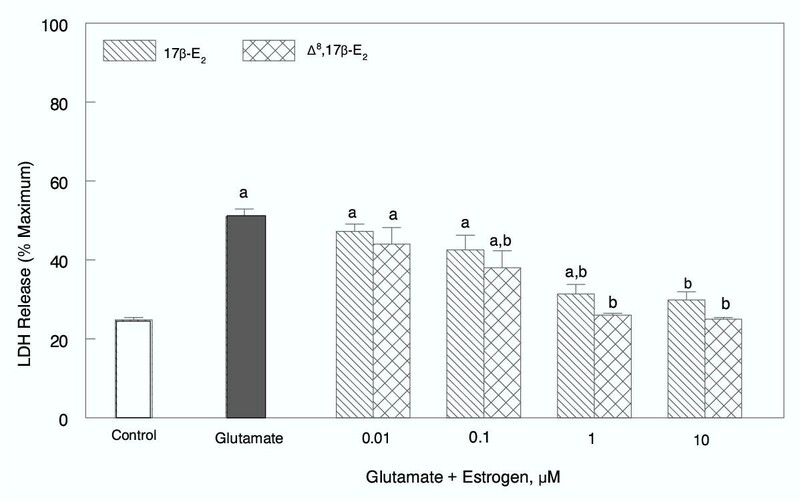 These glutamate-induced changes were reversed in the presence of estrogens. Thus, increasing concentrations of 17β-E2 in the presence of 5 mM glutamate for 18–20 h, increased the levels of Bcl-2 and decreased the Bax protein in a dose-dependent manner (Figure 8). As can be seen, 1 μM to 10 μM 17β-E2 reversed the glutamate-induced changes and the levels of Bcl-2 proteins returned to control values with 10 μM 17β-E2 (Figure 8). Similarly, increasing concentrations of Δ8,17β-E2 in the presence of 7–8 mM glutamate for 8 h increased the levels of Bcl-2 in a dose-dependent manner (Figure 9). At a concentration of 0.1 μM, Δ8,17β-E2, the levels of Bcl-2 increased by 25–35% over the glutamate alone levels (Figure 9). In contrast, the levels of Bax decreased significantly only at the highest (10 μM) concentration of Δ8,17β-E2 (Figure 9). At this concentration of glutamate (7–8 mM), the changes in levels of Bcl-2 and Bax were not reversible by 17β-E2 (Figure 10). 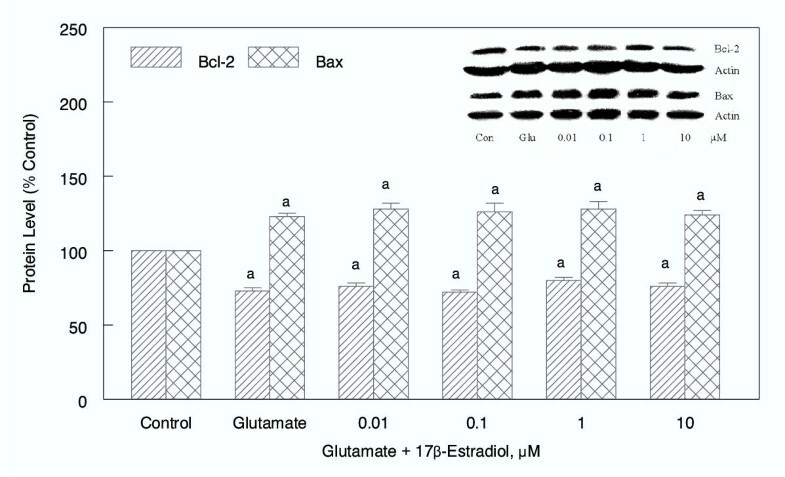 Estrogen in absence of glutamate did not alter the control values of both Bcl-2 and Bax (data not shown). Effect of various concentrations of glutamate on Bcl-2 and Bax protein levels in HT22 cells treated for 8 h. Western analysis was carried out as described under Methods and the blots are shown in the upper right hand corner. The bars depict densitometry analyses of Western Blots from three independent experiments. (± SEM). Note the significant decrease in Bcl-2 levels and increase in Bax levels following exposure of cells to glutamate; * P < 0.05 vs untreated control cells. Effect of various concentrations of 17β-estradiol on Bcl-2 and Bax protein levels in HT22 cells treated with 5 mM glutamate for 18 h. Western blots are shown on the upper right hand corner and the bars depict densitometry analysis. Note that the glutamate-induced changes (cell death) in Bcl-2 and Bax are reversed in the presence of 17β-estradiol. a = P < 0.05 vs untreated control cells. b = P < 0.05 vs glutamate alone treated cells. Effect of various concentrations of Δ8,17β-estradiol on Bcl-2 and Bax protein levels in HT22 cells treated with 7–8 mM glutamate for 8 h. Western blots are shown on the upper right hand corner and the bars depict densitometry analysis. 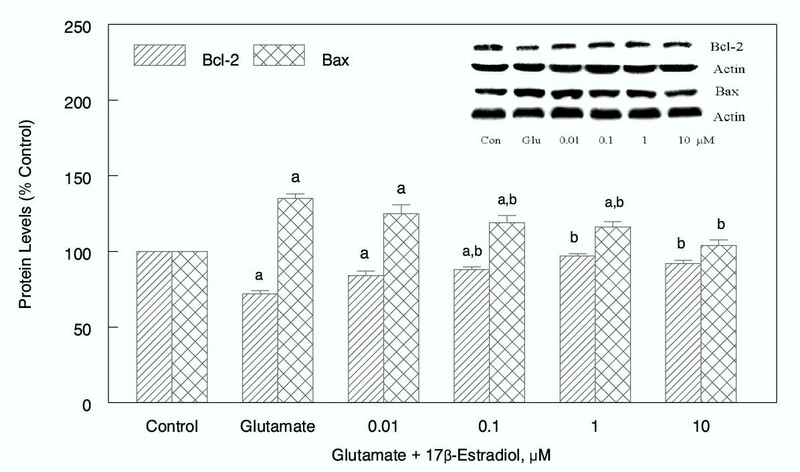 Note that the glutamate-induced changes (cell death) in Bcl-2 and Bax are reversed in the presence of Δ8,17β-estradiol. a = P < 0.05 vs untreated control cells. b = P < 0.05 vs glutamate alone treated cells. 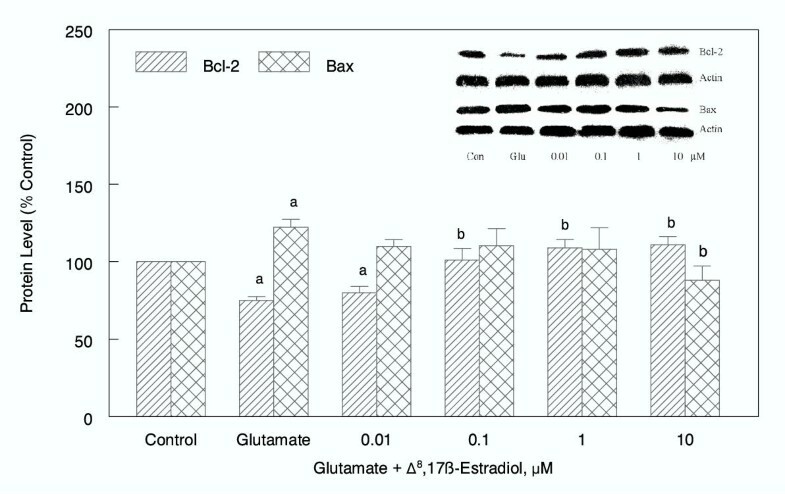 Lack of an effect of 17β-estradiol on Bcl-2 and Bax protein levels in HT22 cells treated with 7–8 mM glutamate for 8 h. Western blots are shown on the upper right hand corner and the bars depict densitometry analysis. 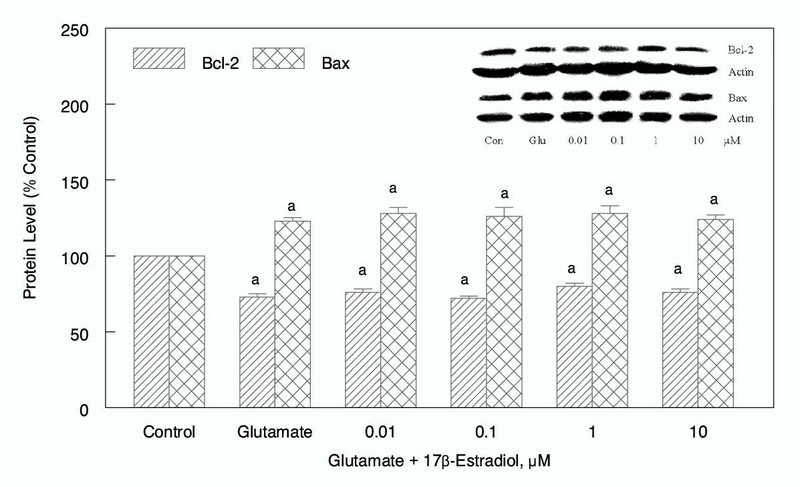 Note that the glutamate-induced changes in Bcl-2 and Bax are not reversed by 17β-estradiol in the presence of glutamate. a = P < 0.05 vs untreated control. In this study, we used clonal mouse hippocampal cell line HT22 in culture, to test the hypothesis that glutamate can induce neuronal cell death by apoptotic mechanisms and that this process can be inhibited or reversed by some novel equine estrogens. Our results clearly indicate that glutamate-induced cell death results via a mechanism that involves DNA fragmentation characteristics of apoptosis. Glutamate-induced DNA fragmentation in HT22 cells was dose-dependent and maximal fragmentation occurred between 18 to 24 h in the presence of 10 mM glutamate. At glutamate concentrations below 10 mM, DNA fragmentation was not clearly visible most likely due to the lack of sensitivity of the method. Our results in general, are in keeping with a previous study, where similar DNA fragmentation was observed in HT22 cells that had been treated with glutamate . A number of studies suggest that formation of large molecular weight DNA fragments is a committed step in the apoptotic cell death process [30–32], however, in the present study only the subsequent late event of apoptosis characterized by low molecular weight DNA fragmentation (DNA ladder) was measured. Although this form of DNA fragmentation is a late event in apoptosis, it is considered to be one of the characteristic features of apoptosis  and is not seen in necrotic cell death. The formation of DNA ladders was completely blocked by 3 equine estrogens: 17α-Eqn, Δ8-E1 and Δ8,17β-E2. The remaining 8 estrogens tested did not inhibit the DNA fragmentation at the concentrations used. 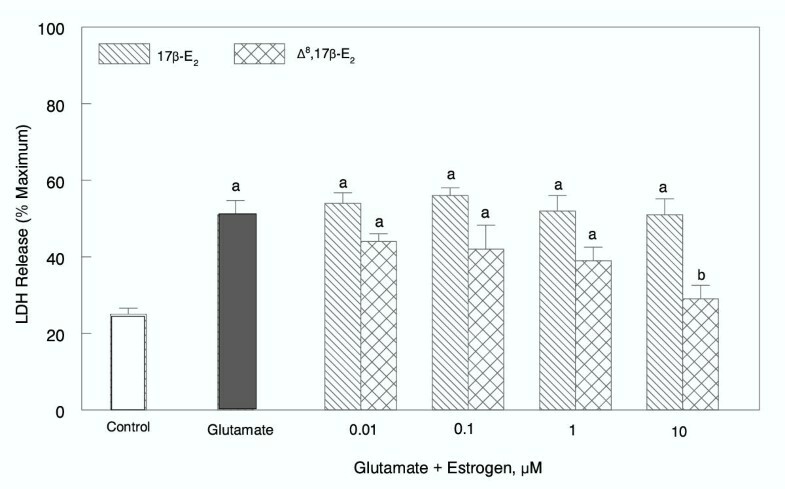 These results indicate that under the experimental conditions of our study, the most potent endogenous estrogen in human 17β-E2, which has the highest affinity for ERα and ERβ [25, 34], was ineffective in preventing DNA degradation induced by 10 mM glutamate over a period of 24 h.
In contrast, we have previously reported  that all eleven estrogens differentially prevented glutamate-induced cell death in HT22 cells. However, the concentration of glutamate used in that study were relatively low (LD50 1.8 mM). At these low concentrations (<10 mM), low levels of DNA fragmentation occurs but the laddering was difficult to visualize (Figure 1A, Lane 3). It is therefore, probable that the ineffectiveness of some estrogens to prevent DNA fragmentation induced by 10 mM or higher concentrations of glutamate may be due to a much higher number of cells were undergoing apoptotic cell death and thus exhibited DNA fragmentation. At these high concentrations of glutamate, cell death was greater than 50% as measured by LDH release assay and under these conditions, only 3 of the 11 estrogens were able to prevent or inhibit this process; This LDH data will be discussed later. The mechanism by means of which large molecular weight DNA fragmentation occurs has not been fully delineated, however, it has been postulated that specific endonucleases, DNase I and/or DNase II may be involved in this process [35–38]. It has also been shown that the enzyme activity required for high molecular weight DNA fragmentation during drug-induced apoptosis may exist as a proendonuclease that is converted to an active form by the action of cysteine protease . Whether estrogens can inhibit this activation and thereby prevent apoptosis, remains to be investigated. The glutamate-induced DNA fragmentation and subsequent cell death was also confirmed by morphological changes observed by phase contrast microscopy. Similar observations have been reported in cell death induced by glutamate and amyloid β-protein in rat primary hippocampal neurons and HT22 cells . Our results further extend those observations by demonstrating that the morphological changes induced by glutamate were prevented by Δ8,17β-E2 and 17β-E2 (Figure 2). This morphological data also indicates that Δ8,17β-E2 was more potent than 17β-E2. Although we have previously reported that the neurotoxic effects of oxidized LDL  and glutamate  are inhibited differentially by various estrogens, the results from the present study are, to our knowledge, the first observations whereby estrogens also have differential effects in preventing low molecular weight DNA fragmentation and morphological changes associated with apoptosis. To quantitatively estimate the extent of cell death induced by glutamate, we measured the LDH activity released in media during culture of cells [7, 40]. This assay has been further validated by us, using the MTS (3-[4,5-dimethylthiazol-2 yl]-5 [3-carboxymethoxy phenyl]-2H tetrazolium, inner salt) cell proliferation assay, which measures the number of viable cells . The results of these LDH measurements indicate that neurotoxicity induced by glutamate was both time and concentration dependent. The release of LDH induced by 5 mM glutamate was completely inhibited by 1 μM Δ8,17β-E2 and 10 μM 17β-E2. At lower concentrations, 0.1 and 1 μM, these two estrogens also significantly protected the cells from glutamate induced cell death. This differential neuroprotective effect of estrogens was also previously reported by us using oxidized LDL as the neurotoxic agent . In contrast to our observations, and those of others , an earlier study  reported that glutamate was unable to induce cell death of HT22 cells and the authors ascribed this failure to the absence of glutamate receptors in these cells. However, the authors have indicated their failure to observe the toxic effects of glutamate were most likely due to the presence of the potent antioxidant glutathione in their culture medium (RPMI-1640). This is of particular importance as glutamate neurotoxicity appears to involve at least two pathways: excitotoxicity which is mediated via the glutamate receptors, and oxidative glutamate toxicity which is mediated via inhibition of cystine uptake into the cell through the cystine/glutamate antiporter [3, 42]. This process under physiological conditions, carries cystine into the cells and glutamate out. The lack of cystine leads to depletion of intracellular antioxidant glutathione (cysteine containing tripeptide) crucial for cell survival . Thus, inclusion of glutathione in the culture media could have protected the HT22 cells from oxidative stress and cell death induced by glutamate [26, 43]. In order to investigate the biochemical mechanisms responsible for glutamate-induced cell death, we are in this report, presenting data demonstrating that in HT22 cells, glutamate significantly decreases the expression of the antiapoptotic protein Bcl-2 and increases the levels of proapoptotic protein Bax in a dose and time-dependent manner. Since the HT22 hippocampal cells that we used in our study lack ionotrophic glutamate receptors, neuronal cell death induced by glutamate is most likely mediated via the "oxidative pathway" [26, 27, 43] that involves reactive oxygen species (ROS). This type of ROS-induced neuronal death has also been previously observed in β-amyloid, nerve growth factor or serum deprivation-induced apoptosis [2, 11, 26, 27, 44, 45]. Thus, in HT22 cells, our results together with those of others indicate that the mechanism involved for induction of cell death and its prevention, was independent of both glutamate and estrogen receptors, and most likely, involved modulation of free radical mediated oxidative damage [2, 3, 6, 11, 27]. We have previously reported that a number of equine estrogens that are components of the drug CEE (Premarin, Wyeth Pharmaceuticals, USA, Canada) used extensively for management of vasomotor symptoms and osteoporosis in postmenopausal women, are potent antioxidants  and protect neuronal cells against cell death induced by oxidized LDL and glutamate [16, 24, 43, 46]. The results from the present study indicate that these equine estrogens prevent cell death and changes in the levels of two key proteins Bcl-2 and Bax induced by glutamate. Specifically, we show that glutamate-induced decrease in the expression of antiapoptotic protein Bcl-2 and an increase in the levels of proapoptotic protein Bax was reversed by estrogen. Since HT22 cells also lack the presence of estrogen receptors , our data strongly suggest that the estrogen mediated regulation of apoptosis in our model system does not involve the classic estrogen transcriptional regulation. Thus, estrogen-reversed glutamate induced reduction in Bcl-2 protein expression and this was accompanied by increased neuronal cell survival. This estrogen-induced process may involve a non-genomic mechanism in HT22 neuronal cells. In contrast to our results, previous studies  in primary cultures of rat fetal hipocampal neurons, β-amyloid-induced neuronal cell death was inhibited by estrogen via the estrogen receptor mediated transcriptional up-regulation of Bcl-xl. However, other studies using either primary culture of rat fetal cortical neurons or HT22 cells, showed that the estrogen protective effect against glutamate toxicity, was mediated via a pathway not involving estrogen receptors [7, 10]. These observations suggest that estrogens' neuroprotective effects can involve both genomic and non-genomic mechanisms, that depend on the neuronal cell type and the cytotoxin used to induce apoptosis. With oxidized LDL and glutamate as neurotoxic agents, all estrogens tested were neuroprotective, however, the potency was variable [16, 24] in that the novel Δ8-equine estrogens were several times more potent than 17β-E2. The results from the present study also indicate that Δ8,17β-E2 was able to prevent glutamate-induced neuronal cell damage at doses that were 10 times lower than those of 17β-E2. These observations suggest that the presence of an isolated double bond between carbon positions 8 and 9 significantly increases the neuroprotective activity of estrogens. A number of other mechanisms have been proposed to explain how estrogens may influence neuronal survival and some of these are: estrogens can alter cellular calcium which may play a role in glutamate cytotoxicity, alter synaptogenesis by interactions with the NMDA receptors, and phosphorylate cAMP (cyclic adenosine monophosphate) response element binding protein (CREB) leading to neuronal protection [48–50] and these have been recently discussed . Since the Bcl family of proteins is made up of a group of apoptosis regulatory genes of which Bcl-2 and Bcl-xl are antiapoptotic, whereas Bax, Bcl-xs, Bad, Bak, and Bik are proapoptotic, the ratio of Bcl-2 to Bax will determine whether the cells will undergo apoptotic cell death or survive the death insult. Our results suggest that perhaps a key mechanism by means of which equine estrogens protect HT22 neuronal cell death is by altering this ratio in favor of Bcl-2 i.e. increase in the antiapoptotic regulatory gene concomitant with a decrease in the expression of proapoptotic genes. Along with Bcl-2 and Bax, other mitochondrial proteins are known to play a key role in mammalian cell apoptosis and a number of mitochondrial proteins, appear to be able to activate the apoptotic process directly [51, 52]. Among these are two proteins: apoptosis inducing factor (AIF), and endonuclease G (Endo G) that are released in response to death signals and appear to execute apoptosis and kill cells in a caspase-independent fashion. Both AIF and Endo G can enter the cell nuclei and cause chromatin condensation and large scale fragmentation of DNA [53–55]. Like the release of mitochondrial cytochrome C, these two apoptogenic proteins appear to be regulated by the Bcl-2 family of proteins [52, 56]. Whether the inhibition of glutamate induced apoptosis by estrogens observed in our study is mediated by changes in the release of cytochrome C, AIF and Endo G, remains to be investigated. Interestingly, since we observed the oligonucleosomal DNA fragmentation (Figure 1), a process that is known to be necessary for Bax-induced cell death and is thought to be entirely dependent on caspase-3 activated DNAse, whether this protease is present in HT22 cells is being investigated. It has been demonstrated that Bax-induced cell death may not require caspase-3 like protease activity . In this cell death pathway Bax induces changes in mitochondrial function that ultimately result is known in cell death independent of known interleukin 1β-converting enzyme (ICF)-like cysteine proteases such as caspase-3 . Bax has also been shown to induce mitochondrial cytochrome C release into the cytosol followed by rapid activation of caspases causing cell death . Whether equine estrogens protective effects are mediated by alterations in mitochondrial function is under investigation. The results of our study indicate that in HT22 mouse hippocampal cells glutamate induces apoptosis that is associated with DNA fragmentation and upregulation of the proapoptotic protein Bax and down-regulation of the antiapoptotic protein Bcl-2. This apoptotic process can be differentially prevented by two equine estrogens with the Δ8-estrogen being more potent than the classic estrogen 17β-E2. Interestingly, these Δ8-estrogens are less feminizing estrogens than the classic estrogen 17β-E2. Further chemical modifications of these Δ8-estrogens may provide more selective estrogens that will be useful in the prevention of neurodegenerative diseases such as Alzheimer's disease and Parkinson's disease in both genders. Rabbit polyclonal antibodies to Bcl-2 (N-19:SC492), and Bax (N-20:SC493) and goat polyclonal antibody to actin (I-19:SC1616) were purchased from Santa Cruz Biotechnology (Santa Cruz, CA, U.S.A.) All other antibodies were from Sigma (Toronto, On. Canada). Super Signal West Pico Chemiluminescent substrate was obtained from Pierce (Rockford, Il, U.S.A.). The Cytotox 96 Non-radioactive Cytotoxicity Assay Kit (Promega G1780) was purchased from VWR (Toronto, Ontario, Canada). The mouse hippocampal cell line (HT22) were grown essentially as described previously . Briefly, HT22 cells were grown initially in 75 cm2 (250 mL) flasks using Dulbecco's Modified Eagle Medium (DMEM, Sigma, Toronto, Canada) containing 4.5 g glucose/L, 50,000 U penicillin/L (Invitrogen, Burlington, On. Canada), 75 mg/L Streptomycin/L (Invitrogen), 1.5 g sodium bicarbonate/L, 10 mM Hepes, 5% horse serum and 10% fetal bovine serum. During the developmental phase of methods, experiments were carried out using both untreated serum or charcoal stripped serum (free of estrogens and other steroids) and no difference was observed in the rate of growth or the maintenance of these cells. Similarly, addition of estrogen alone did not affect HT22 cell proliferation under the experimental conditions used. All experiments were subsequently carried out using untreated serum and in media containing phenol red. This serum may contain trace amounts of glutamate, the actual concentrations of glutamate indicated has not been corrected. Since the results are expressed in terms of changes against the control, the overall results and conclusions are not affected. Cells were maintained at 37C in 5% carbon dioxide atmosphere. Exponentially, growing cells were plated on 6 well plates at 2 × 105 cells per well. After 24 h, medium was changed and cells were treated with various concentrations (5 to 20 mM) of glutamate in presence or absence of estrogens. At various times (3 to 18 h), the cell death was determined by the LDH (lactate dehydrogenase) cytotoxicity assay. At glutamate concentration of 8 mM, approximately 40 to 50% of cell death occurred in 8 h.
Protein levels of Bcl-2, and Bax were determined by Western blotting using standard protocols. In brief, cells were washed with cold PBS, harvested using a cell scraper, and lysed in buffer (9 mM Na2Po4, 1.7 mM NaHPO4 and 150 mM NaCl, pH 7.4), containing 1% Nonidet P-40 (Sigma), 0.5% sodium deoxycholate, 0.1% SDS and 1 mM phenyl methyl sulfonyl fluoride for 20 min on ice. Cell lysates were centrifuged at 10,000 g for 10 min at 4C and the protein content was determined by the Bradford method (BioRad, Toronto, On, Canada). Lysates containing 15 to 25 μg of protein were added in equal volume of 2 × reducing sample buffer (100 mM Tris-HCl, pH 6.8, 200 mM dithiothretiol, 4% SDS, 20% glycerol, and 0.2% bromophenol blue). Samples were electrophoresed on 12% polyacrylamide gels under constant current (14–15 mA), and then electrotransferred to Protan nitrocellulose membrane (Schleicher and Schuell Inc. Keene NH, USA). The membranes were blocked with 5% non-fat milk in TBST (20 mM Tris-HCl, pH 7.6, 137 mM NaCl, 0.05% Tween 20) at 4C overnight and then incubated with primary antibody for 1–2 h at room temperature, washed three times with TBST and incubated (1–2 h) with appropriate horse radish peroxidase (HRP)-conjugated secondary antibody (Sigma, Toronto, On, Canada). The membranes were washed three times with TBST and the immunoblots were visualized on x-ray films after exposure to enhanced chemiluminescence reagents (ECL, Amersham, Toronto, On. Canada). Actin bands were monitored on the same blot to verify the consistency of protein loading. Briefly, the immunoblots were stripped with TBST containing 0.04% sodium azide for 30 minutes at room temperature. The blots were probed with anti-actin primary antibody and appropriate secondary antibody (anti-goat) as described above. The band intensity was determined from scanned images using UN-SCAN IT Gel Automated Digitizing System, Version 5.1 (Silk Scientific, Inc, Orem, Utah, USA), software. Each experiment was repeated at least 3 times and the combined data were compared using the Student's paired t-test. Apoptotic cells often produce a unique ladder made up of nucleotide fragments which can be easily visualized by DNA-agarose gel electrophoresis. We have therefore used DNA fragmentation as the criteria for apoptotic cell death and this was determined by modification of previously described procedures . Briefly, HT22 cells. 5 × 105 were cultured in 8.5 cm Petri dishes for 24 h. in 8 mL of medium. Various concentrations of glutamate (5–20 mM) were added in the presence or absence of various concentrations of equine estrogens: (10 μM) estrone (E1), 17β-estradiol (17β-E2), 17α-estradiol (17α-E2), equilin (Eq), 17β-dihydroequilin (17β-Eq), 17α-dihydroequilin (17α-Eq), equilenin (Eqn), 17β-dihydroequilenin (17β-Eqn), 17α-dihydroequilenin (17α-Eqn), Δ8-estrone (Δ8-E1), and Δ8,17β-estradiol (Δ8,17β-E2) for 18 h. The cell monolayers were washed twice with ice cold TBS (20 mM Tris-HCl, pH 7.6, 137 mM NaCl) and then scraped off the dish with a policeman and transferred with 1.5 mL TBS into a centrifuge tube. The cell suspension was centrifuged at 1500 g for 10 minutes at 4C. The cell pellet was resuspended in TBS and recentrifuged. The cells were lysed in buffer (10 mM Tris·HCl, pH 8.0, 0.1 M EDTA, 20 μg/mL pancreatic RNAase and 0.5% SDS). The mixture was incubated for 1 h. at 37C and to the viscous solution, proteinase K (100 μg/mL) was added and incubated for 3 h. at 50C. After cooling to room temperature, the solution was extracted with phenol and chloroform and DNA precipited with ethanol. The DNA (5 μg) was loaded onto 1.5% TBE agarose gel and electrophoresed for 1.5 h at 100 V. The DNA fragments were visualized by staining with ethidium bromide and pictures of the gels were taken under UV transillumination. Each experiment was repeated at least three times. Cell death was measured by the Cytotox 96 Assay kit which quantitatively measures the release of lactate dehydrogenase into the medium following cell lysis or cell death. This assay was used as described by the manufacturers. The results are expressed as a percentage of maximal LDH released following lysis with 0.1% Triton X-100. This work was supported by the Medical Research Council of Canada Grant MT-11929 and a basic research grant from Women's Health Care Research, Wyeth Pharmaceuticals, Philadelphia, PA, USA. YMZ is a postdoctoral fellow who participated in the development of the hypothesis, study design and carried out most of the experimental work and preparation of the manuscript. XFL is a research associate who did all the work pertaining to DNA fragmentation. All authors have read and approved the final preparation of the manuscript and its submission to BMC Neuroscience.